How did you come to write about Turkish cheese? I observed that Turks themselves were not curious or passionate when it came to their own cheeses – mostly they ate them at breakfast and the vast majority only ate “beyaz peynir” or had maybe a “tulum” cheese to accompany rakı. All these beautiful and delicious cheeses are mostly unknown around the country! I decided to approach an İstanbul hobby publisher with the idea of a cheese book but eventually partnered with Boyut Yayınevi to publish my manuscript. The book is now in its second printing. What was your approach in researching this field? I divided Turkey into east and west and made two separate research trips to each area of the country. I followed my nose and taste buds to local markets, to mountain villages, to stores selling cheeses and followed interesting leads that turned up along my cheese trail. As is usual in Turkey, numerous people were helpful and enthusiastic. Most cheeses fell into groups by their regions, towns/cities or even hamlets. Broad differences like tulum or teneke/cow’s milk and ewe’s milk/herbed (otlu) cheeses are also discussed in the book that is primarily devoted to cheeses made from raw (unpasteurized) milk. Can you give us three examples of relatively unknown and unique cheeses you came across during your research in Turkey? Just for its appearance alone (it looks somewhat like witches’ hair or uncarded wool! ), civil peyniri is quite unique although not well known outside of Erzincan or Sivas. Sünme peyniri from Antakya also is interesting with a stringy, elastic appearance. Braided or örme cheese found in Diyarbakır benefits from being soaked in hot water to rinse away some of the salt and encourage it to release its flavor. Sürk from Antakya/Hatay resembles an oversized orange strawberry. It is fiery hot and somewhat dry and crumbly but absolutely in a class of its own for shape, flavor and color. Turkey’s cheeses that should be exported and appreciated by the world are Erzincan, Bolu, Ezine, Edirne, the better known Kaşar cheese as well as Van cheese made with succulent herbs (Van Otlu peyniri). Can you give us a few examples of interesting discoveries during your research? Techniques, places, tastes.. The most interesting discovery was Turkey’s amazing migratory peoples who take their herds seasonally up and down between lowlands and mountain pastures and plateaus (yayla). This is, sadly, a dwindling way of life but these people are traditional, stoic and a fascinating part of Turkey’s culture and history. Nobody else in Turkey so perfectly illustrates the connection between food and the history of civilization. The formation of blue cheese was a wonderful discovery. Not ‘injected’ spores like most other blue-vein cheeses, but a happy accident of nature when air leaks into a ‘seam’ in a tulum cheese. Goats who ate the bark of cedar trees at high altitudes produced milk with a slightly greenish tinge and the yoghurt and cheese made from this milk really has a distinct ‘coniferous’ taste. There are also interesting traditions surrounding the practices of making cheese. For example, the exact minute or second for adding the rennet (maya) in the cheese-making process is the domain of the senior matriarch of the family, a tradition that she passes down to a daughter or her daughter-in-law. Did you come across any unique techniques used in production of cheese in Turkey? Not really, because most European or North American cheeses are produced with a soft or hard rind. Turkey also doesn’t make soft-mold cheeses like Brie and Camembert. Only Kaşar, as well as the Kaşkaval from Trakya, uses a ripening process that creates a hard rind similar to Cheddar. However, I found the tulum method of making cheese (packing the cheese into an animal hide) to be quite unique. Although you won’t, unfortunately, find this in stores or supermarkets, the production of potted or çömlek or testi cheeses ripened in the dark in earthenware jugs is also distinct to Turkey where many families still make cheeses for their own use this way (the best I ever tasted was from Erzincan). Another interesting practice that is unique to Turkey is to have cheeses like Civil or Gaziantep cheese that must be soaked in hot (or boiling) water to make them creamy and edible. What are your favorite Turkish dishes that exemplify the quality and taste of Turkish cheese? I don’t think Turkey has enough dishes that use cheese as an ingredient. I would love to see these cheeses used for more than pizza toppings or as a breakfast food. But I love the traditionally cooked pancake, or gözleme/katmer, with plenty of cheese included. It is probably not everyone’s favorite with its solid, stomach-lining properties but I am very fond of mıhlama, the corn bread and cheese dish made in the Black Sea region. Of course, the best dish with cheese is künefe, a dessert that uses the special type of melting cheese found in Antakya. We thank Suzanne Swan for this interview and for sharing her interesting discoveries about Turkish cheese with our readers. Suzanne Swan’s picture above was provided by Mrs. Swan and is used with permission. Born in Canada, Suzanne Swan travelled extensively and lived in England, Bahrain, Singapore, Malaysia and other countries. In 1988, when she visited Turkey as a self described “typical accidental tourist with preconceived ideas about Turkey,” she was dazzled by what this country had to offer and decided to live and write in Turkey experiencing the culture to its fullest. After mastering Turkish as a language and working as a foreign correspondent, bureau chief and correspondent for various publications unrelated to food, in 1999 she was asked to write the original “Eyewitness Travel: Turkey” for Dorling-Kindersley as a sole author. Many travel books and guides followed and she soon came to observe a void that existed in Turkey for specifically food-related books, and especially the lack of any book about Turkey’s unique and stunning array of cheeses. 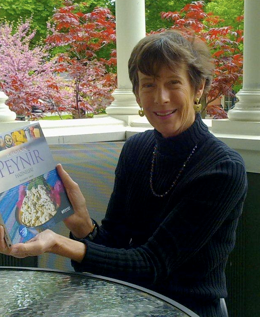 She is the author of “The Treasury of Turkish Cheeses” (Türkiye’nin Peynir Hazineleri), in addition to "Spas and Hot Springs of Turkey," a book on Turkey’s many geothermal hot springs (Türkiye’nin Spaları ve Termal Kaynakları) and a recently published cultural handbook on Turkey published by Berlitz/Insight Guides. Suzanne Swan who wrote the book on Turkish cheese says, Turks are “not curious or passionate when it came to their own cheeses. All these beautiful cheeses are mostly unknown around the country.” So she made it her mission to go exploring this unknown world of Turkish cheese, all around Turkey. Here is our interview with Mrs. Swan about her cheese adventures and interesting discoveries on this mission.